Do you need to lease a copier? Leasing a copier is a cost effective way for companies to receive all of the benefits of a multifunction copier, without a large upfront output of capital. Leasing a copier in Arizona couldn’t be easier- Arizona Copiers offers the highest quality copiers on the market, with terms that are flexible, and prices that are affordable! 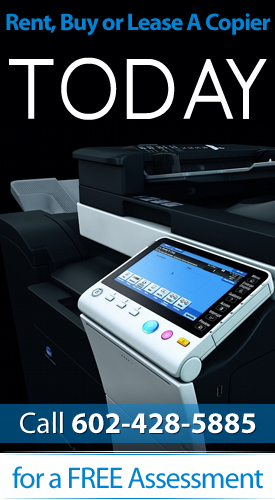 When you are thinking about leasing a copier in Arizona, please contact us. A knowledgeable member of our team will answer all of your questions, and help you select a copier that will best suit your needs. If you decide that you no not want to lease a copier, Arizona Copier also offers copier rentals and copiers that are available for purchase.